This product will be arriving very soon - Mid-May 19! Crafted from terracotta, the set of 3 Black Brown Dipping Bowls form part of the terracotta pottery collection. 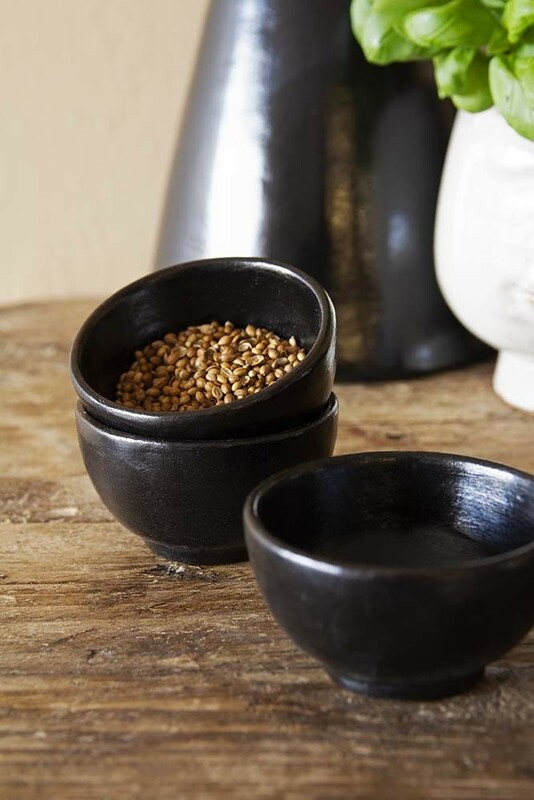 Featuring a traditional terracotta finish in earthy black and brown tones, each bowl within the set measures 5cm in height x 8cm diameter and is perfect for entertaining. Elegant and practical, the entire collection of Black Brown Terracotta tableware, from tagine and casserole dishes to jugs and dipping bowls are crafted from traditional techniques to achieve the unique, black finish that defines the range. Sold as a set of three, the dipping bowls can be used for serving, condiments and dips or as handy snack bowls when you have guests over. Small enough to store away with ease, the terracotta bowls are the perfect addition to any kitchen, large or small and also make great gifts for foodies! Creating artisan pieces for modern use, the terracotta range is safe to be used in the dishwasher, oven or microwave. Ideal for when you want to make a little extra effort, the Set of 3 Black Brown Terracotta Dipping bowls help to set the scene for a decadent dinner party when paired with black plates and rustic wood furniture. When you’re not entertaining, the bowls can be used as pinch pots for salt and pepper or stacked up on the side amongst cookbooks and garden herbs for a decorative statement. This product will be arriving at Rockett St George very soon - Mid-May 19! *Please note, signing up to our product stock availability email will not sign you up to our newsletter mailing list.